The Government has pledged £200,000 to the University of Plymouth to research how sources of microplastics enter the UK's oceans. A new research project analysing the impact of tyres and clothing on the marine environment has been launched today by the Government. 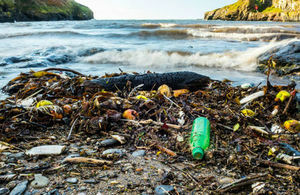 Environment Minister Thérèse Coffey has pledged £200,000 for scientists at the University of Plymouth to explore how tiny plastic particles from tyres, synthetic materials like polyester, and fishing gear – such as nets, ropes and lines – enter our waterways and oceans, and the impact they have on marine life. Following the government’s ban on microbeads, which is one of the toughest in the world, this comprehensive research will be used to improve our scientific understanding of how microplastics from other sources enter the oceans – whether through fibres released into waste water during a washing cycle, or car tyre friction on roads creating a dust of particles that make their way into the seas through sewers. The 11 month project will build on the research already underway – with some scientists estimating tyres contribute 270,000 tonnes of plastics per year while a single wash load of acrylic clothing could release over 700,000 microfibres into the ocean. The impact of plastic pollution on our oceans is one of the greatest environmental challenges of our generation. The UK is already leading the way in this area, but we want to go further – and faster. Robust scientific evidence should support our policy proposals, and through this exciting project we will build on work underway to better understand how microplastics end up in marine environment and what we can do to tackle this in the future. The project is being led by Professor Richard Thompson OBE, who oversaw Defra’s first research project on microplastics and their impact on the marine environment, which led to the UK’s pioneering ban on microbeads in rinse-off cosmetics and personal care products coming into force this year. The International Marine Litter Research Unit at the University of Plymouth is at the global forefront of research into the causes and effects of marine litter and recently conducted research into the effectiveness of fibre-trapping bags in washing machines. The types of microplastics entering the marine environment are incredibly diverse, but recent estimates in Norway and Sweden have suggested that particles of tyre and debris from the road surface could be a substantial source. With very limited real data available to confirm the impact from these sources, there is a genuine and pressing need to establish the true scale of this issue. By combining this with an assessment of the quantities of microplastic from synthetic textiles, we can develop a more complete picture on the relative importance of various sources. We will be able to use our findings to work with the Government, scientists and industry to try to prevent these particles entering the marine environment in the future. Just last month the health of the oceans was on the agenda at the Commonwealth Heads of Government Meeting, where the Prime Minister called for collective global action in the fight against plastic pollution through the Commonwealth Clean Oceans Alliance.